In The White Queen, the BBC show inspired by Philippa Gregory’s novel, Margaret Beaufort was portrayed as a religious nutcase. But while very pious, the mother of Henry VII was also a smart, pragmatic and ambitious woman who had a powerful influence on English history. 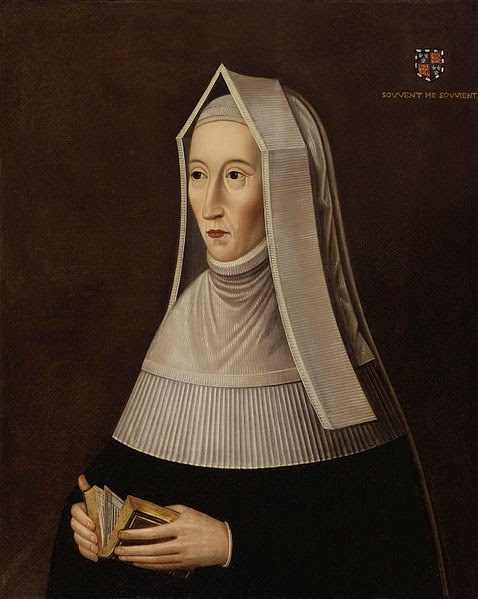 Born on 31 May 1443, Margaret was the daughter of Margaret Beauchamp and her second husband John Beaufort, 1st Duke of Somerset, and the illegitimate son of John of Gaunt and his mistress Katherine Swynford (the couple was later married and the children legitimized). Her father died soon after her birth, so the king, Henry IV granted her wardship to William de la Pole, Earl of Suffolk and steward of the royal household. At the tender age of six, she was married to the Earl’s seven year old son, but the little girl didn’t move in with her new husband straight away. Instead, she was allowed to remain with her mother on the Bletso estate. Some say that it wasn’t a marriage at all, though. Only a betrothal. In any case, a few years later King Henry VI revoked the de Pole’s wardship, handing it over to his own half brothers Jasper and Edmund Tudor. Margaret’s marriage was then annulled. On 1 November 1455, aged only 12, Margaret married the 24 year old Edmond Tudor. The marriage was immediately consummated and, the following year, Margaret gave birth to her only son, Henry. The birth was very difficult, and both mother and son almost died. But it was Edmund who would never see his son, having died a few months before the birth. Margaret moved in with her family in Wales, but was soon separated from her child. The king had granted his wardship to William, Lord Herbert and the child lived with him until he was 12. These were difficult years, not just for Margaret, but for the country too. The War of the Roses raged on and, when Edward IV regained the throne, Henry fled to Brittany, where he remained for 14 years. During most of his young life, Margaret rarely saw her son and communicated with him mostly by letters. Margaret married twice more. On 3 January 1458, she tied the knot with her second cousin, Sir Henry Stafford. The coupled live peacefully together, but never had any children. In 1471, her husband died. The following year, Margaret married again, this time to Thomas Stanley, the Lord High Constable and King of Mann. Their was a marriage of convenience. Thanks to Stanley, Margaret was able to return at court and was even chosen as godmother for one of Queen Elizabeth’s daughters. After Edward IV’s death, the throne was seized by his brother Richard. Margaret briefly served his Queen too. Richard stripped Margaret of all her titles and estate, transferring her properties to her husband. Perhaps he was suspecting that she was plotting with the dowager queen, Elizabeth Woodville, to remove him from the throne. Because Elizabeth’s sons, the Princes in the Tower, were thought dead, the dowager queen agreed to marry her eldest daughter, Elizabeth, to Margaret’s son, Henry. The marriage would unite the two houses of York and Lancaster. Margaret was also very likely involved in the Buckingham rebellion, which failed, also thanks to her husband who supported the King. However, Stanley wouldn’t come to the king’s aid at the Battle of Bosworth Field in 1485. Instead, even though his eldest son was held hostage by Richard, he waited to see how the battle would unfold and, when he was finally ready to fight, it was to support his stepson Henry Tudor. King Richard was killed and Henry became King. It was Stanley that placed the crown on his head after the battle. Margaret was now known as “My Lady the King’s Mother”. Her son also rewarded her by recognising her right to hold property independently from her husband and, towards the end of his reign, he also appointed to her to a special commission to administer justice in the north of England. Margaret now lived away from her husband. In 1499, with Stanley’s permission, she took a vow of chastity. A very pious woman, she was famous for her education. During her life, she founded and supported several schools and churches. Her son was very devoted to her and she had a great influence on her youngest grandson, the future Henry VIII, too. Margaret died in the Deanery of Westminster Abbey on 29 June 1509, the day after her grandson’s 18th birthday and just over two months after the death of her son. She is buried in the Henry VII Lady Chapel of the Abbey.